A handful of neoclassical mansions spread around the charming harbour of the island in all the shades of the colours of the rainbow that reflect under the blinding light of the sun. Characterized by UNESCO as the island of Peace and Friendship, Halki is a mysterious island with artistic landscapes that compose a beautiful image of a marvellous canvas, a charming village waiting to catch your attention. A village of special beauty, Niborio is the colourful capital and harbour of the island! The settlement has an authentic identity with a genuine atmosphere with tall mansions and enormous windows under the red tiled roofs and cobblestone labyrinthine alleys. And what about the size? Whatever Halki lacks in size, it replenishes in landscapes and colours; besides they say less is more. 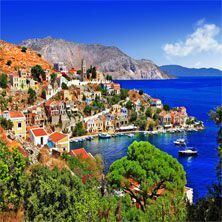 This is Halki, a tiny island with virgin natural beauty eager to be discovered. 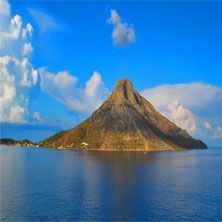 An island with traditional colours and remarkable historical monuments create a peaceful and tranquil environment even for the most discerning travellers. The Settlement of Niborio, else known as Emborio, is the capital and harbour of Halki located on the southeast side of the island. Niborio is the sole inhabited settlement of the island that spreads amphitheatrically around the harbour. Niborio is a charming village with colourful neoclassical houses, elegant houses and narrow alleys. Undoubtedly, Niborio is one of the most beautiful neoclassical settlements of Greece. Worth visiting sights include the three windmills of Halki, the bell tower of Agios Nikolaos and the Town Hall of Halki. The piazza is the heart of the village and an ideal place to wander around. As the village is vehicle-free, the atmosphere is peaceful. The Abandoned Village of Horio is the old capital of the island lying in the shadow of the castle of the Knights on the northern slope of the hill of Agios Nikolaos. The ancient settlement hosts traces of old stone houses, scattered architectural parts of the cemetery, the sarcophagi along with the church of Agioi Anargyroi, the church of Sotiras and an old school. Around the area of Horio, the vaulted church of Panagia Horiani and the small monasteries of Agia Triada and Agios Konstantinos are preserved in good condition. Horio has been nominated as a cultural landmark from Unesco. The Monastery of Agios Ioannis Alargas is a beautiful monastery located in one of the most remote areas of the western side of Halki. The monastery offers panoramic views of the surrounding areas. It is possible to stay overnight in one of the cells by arrangment. The biggest traditional feast of the island takes place at the monastery on the 28th of August. The Island of Alimia is a deserted island located in a close proximity from Halki. Although the island is uninhabited, it has a long history. In ancient times, Alimia provided safe anchorage of the Rhodian fleet and a tower was built in order to observe the surrounding areas in case of pirate invasions. 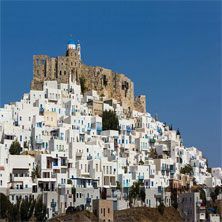 When the Dodecanese were conquered from the Knights of Saint John, a medieval castle was built on the island, whose remains are still visible. The island was abandoned in the 1940s and the deserted village was declared as a protected settlement. 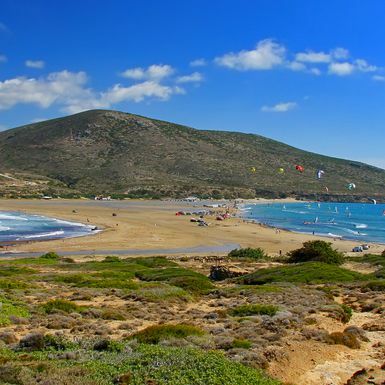 Alimia is an ideal island for excursions to discover the beautiful seashores. Excursion boats operate from the harbour of Niborio. The Castle of the Knights dominates the northeast side of Halki on the hill of Agios Nikolaos. The castle was built on the traces of the ancient acropolis from the Knights of Saint John during the fourteenth century while it was surrendered to the Ottomans in 1522. The castle is accessible through an uphill path that starts from the church Panagia leading to Horio. At the entrance of the castle, there is a built-in coat of arms of the Master of the Knights along with the church of Agios Nikolaos. The castle offers panoramic views of the surrounding areas. The Church of Agios Nikolaos is the imposing church located in the village of Niborio. The church stands out for its beautiful black and white pebbled mosaic courtyard and the majestic bell tower. It is worth mentioning that the bell tower of Agios Nikolaos was constructed with the marbles of the ancient temple of Apollo and it is the tallest bell tower of the Dodecanese. Inside the church, there is a small ecclesiastical museum. The church celebrates in honour of the saint on December 6. The Church of Panagia is a charming chapel located above the deserted village of Horio. Inside the church, one will have the opportunity to admire the beautiful wall paintings of the church. The church of Panagia celebrates in honour of the saint on the August 15. The Monastery of Taxiarhis Michael Panormitis/Palarniotis is located on the hill of Agios Onoufrios close to the abandoned village of Horio. The geometric shapes of the pebbled mosaic of the courtyard of the monastery constitute an authentic sample of the art of the Dodecanese. Here, one can admire panoramic views over the Aegean Sea. The Clock Tower of Halki is located in the charming village of Niborio. The clock tower distinguishes for its remarkable architecture. It was built from the donations of the expatriate Halkian community. The Ecclesiastical Art Museum of Halki is housed within the premises of the church of Agios Nikolaos. Exhibits include artefacts of ecclesiastical art including vestments, icons, bibles and silver dishes. The Traditional House of Halki is located in the charming village of Niborio. Exhibits include artefacts from the local culture and heritage of the island including traditional embroideries and cooking utensils. The Windmills of Halki are the landmark of the island standing on the top of the hill above Niborio. In the old days, the windmills operated by wind as the islands of Greece re renowned for their gusty winds. Although the windmills are no longer operational, they continue to be a symbol of the long history of the island. Niborio, else known as Emborio, is the capital and harbour of Halki located on the southeast side of the island. Niborio is the sole inhabited settlement of the island that spreads amphitheatrically around the harbour. Niborio is a charming village with colourful neoclassical houses, elegant houses and narrow alleys. Undoubtedly, Niborio is one of the most beautiful neoclassical settlements of Greece. Worth visiting sights include the three windmills of Halki, the bell tower of Agios Nikolaos and the Town Hall of Halki. The piazza is the heart of the village and an ideal place to wander around. As the village is vehicle-free, the atmosphere is peaceful. Boat Trip: The Island of Alimia is a deserted island located in a close proximity from Halki. Although the island is uninhabited, it has a long history. In ancient times, Alimia provided safe anchorage of the Rhodian fleet and a tower was built in order to observe the surrounding areas in case of pirate invasions. When the Dodecanese were conquered from the Knights of Saint John, a medieval castle was built on the island, whose remains are still visible. The island was abandoned in the 1940s and the deserted village was declared as a protected settlement. Alimia is an ideal island for excursions to discover the beautiful seashores. Excursion boats operate from the harbour of Niborio. Boat Trip: The Island of Tilos is waiting for you to discover striking medieval castles, imposing mountains with natural springs, pristine beaches, charming churches, the cave of the dwarf elephants and the abandoned medieval village of Mikro Horio! The spectacular beauty of Tilos boasts mountainous and rocky landscapes blessed with verdant hills and an abundant variety of plants of almond trees, bluebells, orchids, oaks and shamrocks that create a colourful patchwork of fragrances. 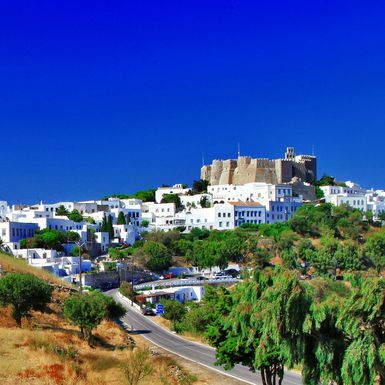 Megalo Horio is the charming capital of the island with a traditional character. Whitewashed houses, flowery courtyards and cobblestone alleys spread around the traces of the medieval castle. When the sun is trying to hide behind the imposing mountains of Tilos, the shades of orange shine under the imperious castle of the Knights. You will be dazzled from the mysterious village of Mikro Horio that comes alive only during the night while the romantic promenades in the charming village of Agios Antonios will amaze you! The wild natural beauty of the island is unique and this is the reason that the local people of Tilos founded a non-profit association for the Ecological Park of Tilos with the purpose of preserving and protecting the natural and cultural heritage of the island through the awareness of the locals and the travellers. 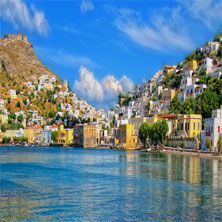 You will be captivated from the indescribable tranquility of Tilos along with its rugged beauty; just don’t forget to take nothing but pictures and leave nothing but footprints! 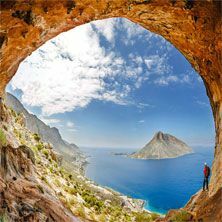 Caving: Halki hosts numerous caves ideal for exploring. One of the most beautiful caves is the cave of Kelia. It is an impressive cave with religious paintings carved on the rocks. Another interesting cave is the cave of Kamenos Spilios. The historical cave served as a shelter of the inhabitants, who died after the Venetian admiral Francesco Morosini blocked the entrance of the cave and set fire. The caves are accessible through short excursion boats from the harbour of Niborio. Hiking: Halki hosts numerous paths ideal for lovers of hiking. (1) One of the most beautiful routes is the one that starts from the village of Niborio, passes by the chapel of Agioi Anargyroi, the ancient vaulted tomb at the location of Spilios tou Arapi, the oil press of Horio and the well of Pano Vryti. 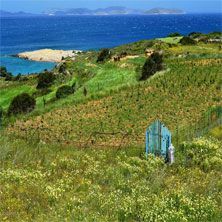 The trail then continues through the old cemetery of Halki and enters the location with the traditional stone huts known as Kifes. Right after the valley, one will find the uphill route towards the monastery of Taxiarhis Michael Palarniotis. (2) Another interesting route is the one that starts from the village of Niborio towards the country church of Stavros tou Xylou. There, one will find an interesting path that leads to the cave of Kamenos Spilios just before the direction to the monastery of Agios Ioannis. The historical cave served as a shelter of the inhabitants, who died after the Venetian admiral Francesco Morosini blocked the entrance of the cave and set fire. After the cave, one can follow the two routes that lead to Lefkos and Pyrgos. 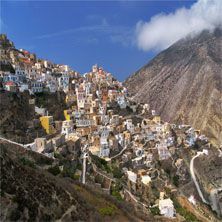 (3) It is also worth following the route that starts from the monastery of Palarniotis and leads uphill to Ai Giorgis. The path passes through traces of medieval churches, ruined windmills and stonewalls. It finally ends up hanging over the sea until it reaches a beautiful landscape with perennial trees. Spearfishing: The crystal clean waters of Halki are ideal for spearfishing. 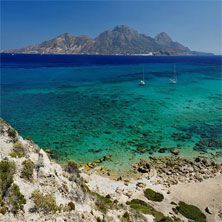 Areta consists from two pebbled beaches with emerald waters located on the northeast side of the island. The beaches are only accessible only by a boat. Ftenagia is a rocky beach with turquoise waters located on the southeast side of the island. It is one of the most beautiful beaches of Halki. The beach is organized with numerous amenities including sunbeds and umbrellas and a tavern. Giali is a pebbled beach with crystal clear waters located on the south side of the island. The beach is secluded ideal for those looking for tranquillity. It can be accessed through a path that starts from the village of Niborio. Kania is a pebbled beach with crystal clear waters and lush vegetation located on the east side of the island. It is an organized beach with sunbeds and umbrellas and a canteen. The beach is an ideal spot for naturists and it is accessible by bus or car. Pondamos is a sandy and pebbled beach with blue waters located on the east side of the island. The beach is very popular owing to its close proximity from Niborio. It is well organized with sunbeds and umbrellas. Trahia is a thin strip of land that connects the peninsula with the island located on the south side of the island. It is a place of extreme natural beauty and it can be accessed either by boat or by a trail starting from the abandoned village of Horio. The local products of the island include honey, local cheese, handmade pasta and spoon sweets. The local specialties of the island include local spaghetti, the lamb stuffed with liver and rice and fresh donuts. Every July, the Festival of Halki takes in Halki in the context of the international designation of Halki as the Island of Peace and Friendship. Every 15th of August, the traditional celebration in honour of the Assumption of Virgin Mary takes place at the Church of Panagia in Horio. Every 29th of August, the traditional celebration in honour of Agios Ioannis takes place at the Monastery of Agios Ioannis Alargas. Every September, the Mandinada and Lyre Contest takes place in Halki. Halki got is name from the copper workshop (Halkos in Greek) that used to be in the island. Before the Olympian Gods, the Titans used to rule the earth. The king of Titans was Cronus who was dethroned from his son Zeus. The majority of the Titans fought with Cronus against Zeus and they were banished to Tartarus. According to mythology, the first inhabitants of Halki were the Titans. Archaeological findings show that the first inhabitants of the island were the Carians, the Dorians, the Phoenicians and the Pelasgians. Halki was conqured from the Arabs until the Venetians and the Genovese took over and built the ancient acropolis and the fortress on the island of Alimia. 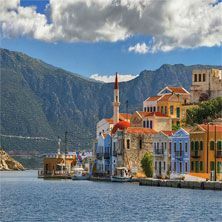 Although the inhabitants of Halki overcomed the fear of pirates and flourished from sponge trade along with the islands of Kalymnos, Kastelorizo and Symi, the island was conquered from the Ottomans and Italians. Halki was incorporated to the Greek State in March of 1948. By Boat (215 Nautical Miles): Halki is accessible from the harbour of Piraeus. The journey usually lasts twenty hours. The easiest way to get to the island is to get to Rhodes by airplane. Ferryboats operate daily from Rhodes to Halki. 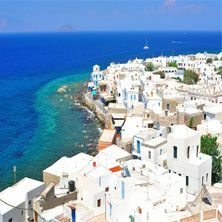 Book your tickets with FerriesinGreece.com ! Undoubtely, one of the most interesting excursion is the deserted island of Alimia. Although the island is uninhabited, it has a long history. In ancient times, Alimia provided safe anchorage of the Rhodian fleet and a tower was built in order to observe the surrounding areas in case of pirate invasions. When the Dodecanese were conquered from the Knights of Saint John, a medieval castle was built on the island, whose remains are still visible. The island was abandoned in the 1940s and the deserted village was declared as a protected settlement. Alimia is an ideal island for excursions to discover the beautiful seashores. Excursion boats operate from the harbour of Niborio. It is highly recommended to visit the abandoned village of Horio that has been declared as a cultural landmark from Unesco. 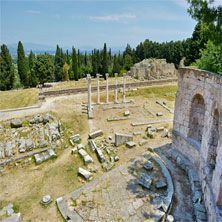 The ancient settlement hosts the traces of old stone houses, scattered architectural parts of the cemetery, the sarcophagi along with the church of Agioi Anargyroi, the church of Sotiras and an old school. Around the area of Horio, the vaulted church of Panagia Horiani and the small monasteries of Agia Triada and Agios Konstantinos are preserved in good condition. Horio has been nominated as a cultural landmark from Unesco. The seaside promenade of Niborio is one of the most charming spots of the island! Choose your tavern and order ouzo while watching the endless blue of the Aegean! The bare mountains of Halki dominate behind the village of Niborio. Although the mountains are not particularly tall, the highest peak of Halki is located at the area of Maestro on the east of the center of the island at an altitude of 593 meters. 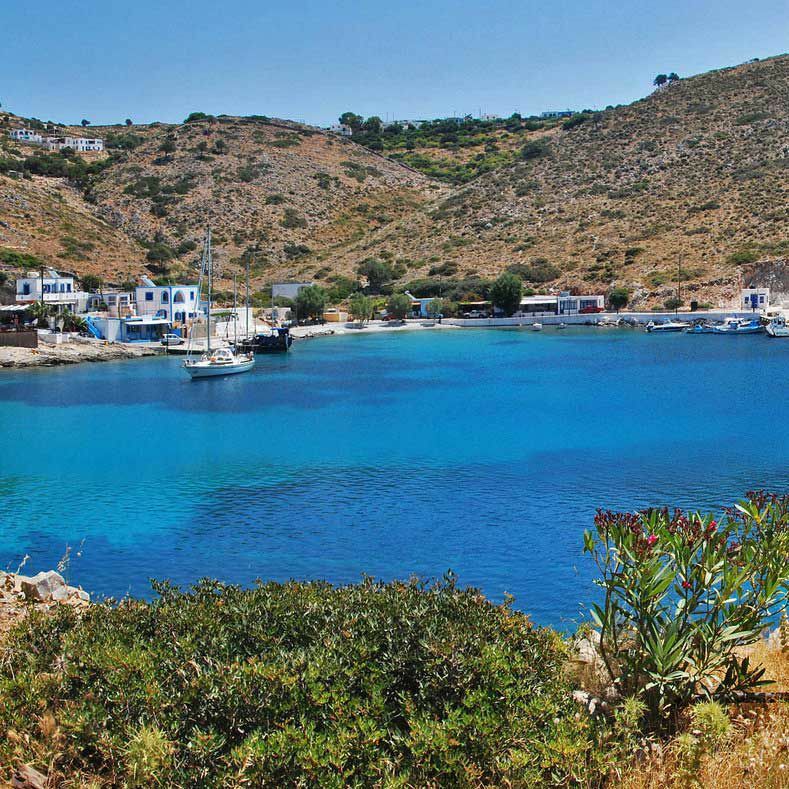 Hop on a traditional boat to discover the pristine beaches of Halki! 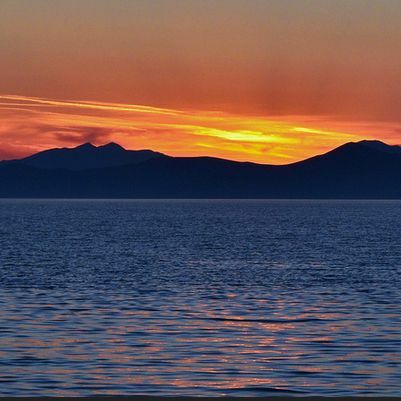 Enjoying the sunset from the harbour of Niborio is definitely a unique spectacle! The Festivals of Halki were always one of the traditional forms of entertainment and religious worship for the inhabitants of the island. Halki has managed to maintain its traditions and customs as reflected from the numerous feasts, festivals and celebrations. The most important festival include the festival in honor of Virgin Mary at the church of Panagia Horiani in Horio (August 15), the festival in honor of Agios Ioannis Prodromos at the monastery of Agios Ioannis Alargas (August 29) and the festival in honor of Archangel Michael at the monastery of Taxiarhis Michael Panormitis (November 8). The festivals of Halki are one of the things you should not miss if you visit the island! The Monastery of Agios Ioannis Alargas is ed in one of the most remote areas of the western side of Halki. It is possible to stay overnight in one of the cells by arrangment. It is worth noting that the night before the feast day of the saint, August 28, the monastery offers free food, lamp with potatoes in honour of the saint. The next morning, the merriment bread is offered. The feast then continues at the central square of Niborio. Halki Official Website can enlighten you! The Bell Tower of Agios Nikolaos is the highest bell tower of the Dodecanese Islands. 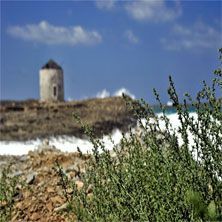 Alimia Isle has been declared as a Special Protection Area from the European Network Natura 2000. The Island of Halki was nominated as the Island of Peace and Friendship from Unesco in 1983.